Salad season just got a whole lot tastier. I suppose now that its warmer, I should swap our favorite dish of mashed potato supreme for something lighter. 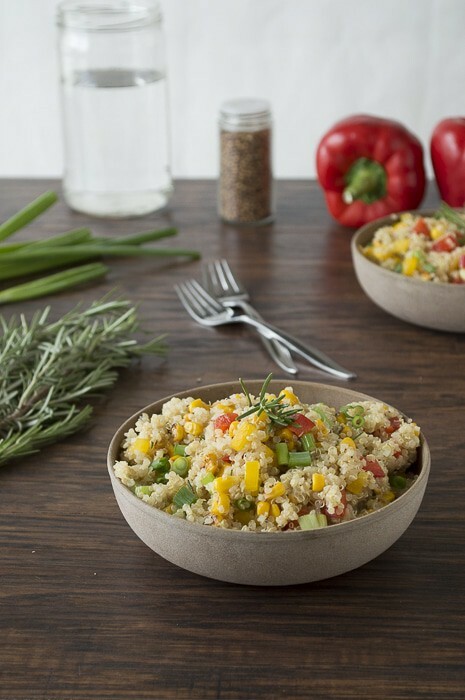 This quinoa and bell pepper salad with rosemary is perfect. I don’t have to turn on my oven and from start to finish it takes under 30 minutes. Cook the quinoa as directed on the package, until all the water is absorbed and the quinoa is fluffy. Quinoa triples after its cooked, so 3/4 cup uncooked quinoa will yield about 2 & 1/3 cups cooked quinoa. Once the quinoa is cooked, put it in the refrigerator to cool. Diced the peppers and green onions. Drain the corn. 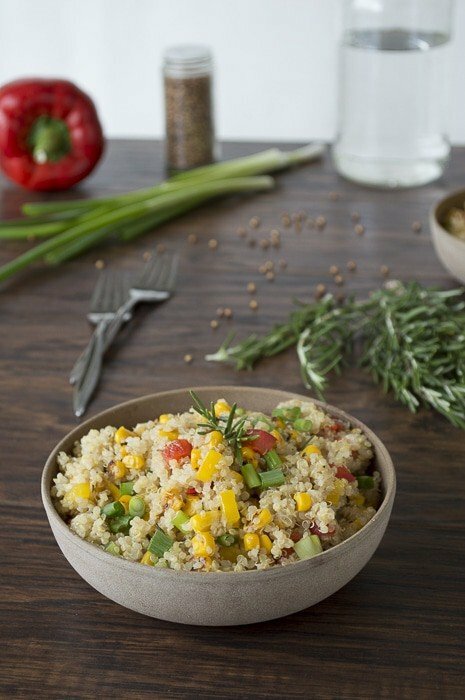 In a large bowl, combine the quinoa, peppers, corn, green onions, lemon juice, honey, oil, vinegar, rosemary and coriander. The salad can be served cold or warm. Grill up some chicken and you just created a great summer dinner. 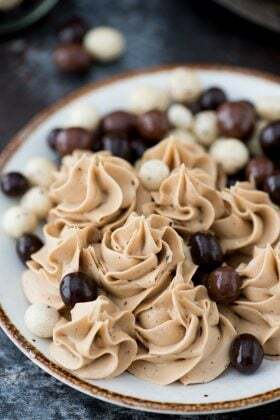 If you’re looking for dessert, I highly suggest our recipe for Banana Pecan Chocolate Chunk Hot Fudge Ice Cream. No churning and no ice cream maker required! Love that you used rosemary and coriander. They are some of my favorite spices. Coriander is newer to me and I really like it! I CRAVE salads like this in warmer weather. Love it girl! This salad sounds great, and the pictures are beautiful! Looks love and fresh Beth! I must admit that I haven’t used quinoa very much, but I am very intrigued. I just planted some rosemary, so this is a must try!! Thanks for posting!! This looks incredible! Thanks for linking up with What’s Cookin’ Wednesday! What beautiful photos of a delicious looking salad! Pinned. 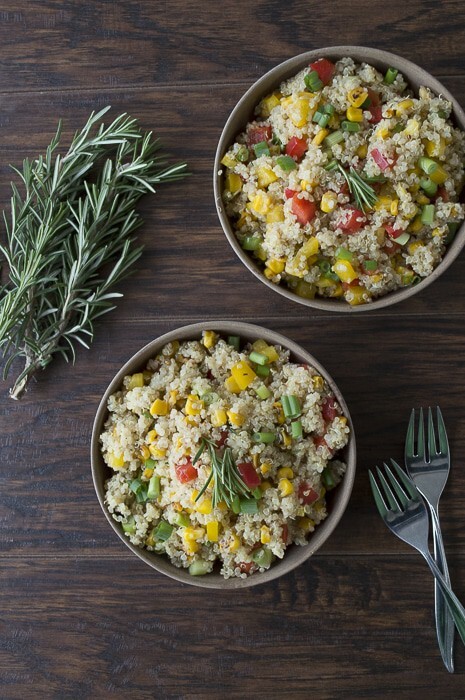 I’m always looking for quinoa recipes to try; this one sounds delicious! Oh lucky you! I’d love free bunches of rosemary! This sounds delicious Beth. Love quinoa salads. The combination of honey and rosemary sounds wonderful. has anyone actually made this? We made it and loved it! Do you have specific questions? Helen, about 3-5 people as a side dish. Enjoy! I like all the flavor you put into this salad. Quinoa really needs it. This is going to be delicious! I agree Christie, without some pizzazz quinoa can be a little bland. I love all of the colors and your photos are beautiful! 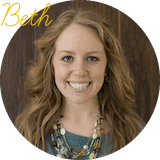 Oh my goodness Beth, this looks so good! Yellow peppers are so sweet, I just love them. 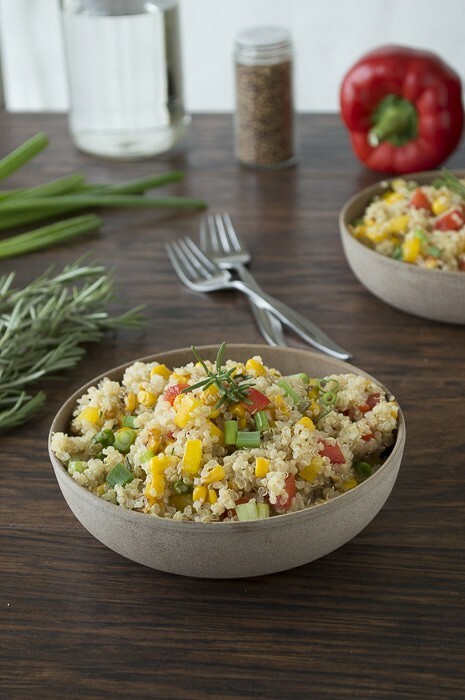 This is a great way to get more quinoa in my diet. Haha, I love that Tanya.. I need more quinoa in my diet too! 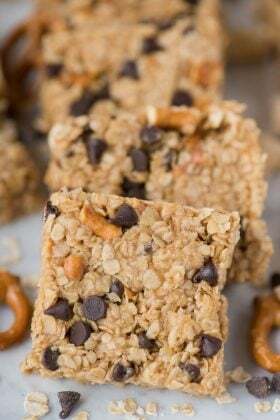 I love using quinoa in recipes lately! So I’m all over this!! I totally agree with you Ashley! Haha yes, I feel fancy when I buy it at the grocery store!